Features & Benefits Direct Stitch Selection You don’t have to search for a stitch, simply press the icon of the stitch you want to sew and start sewing. Start/Stop function Press the Start/Stop button to sew without the foot control. Makes sewing long seams, rows of decorative stitches, free-motion and buttonholes easy. Needle Up/Down Set the needle to stop up or down in the fabric for easy pivoting, appliqué and more. Information System Display See the selected stitch number and the recommended presser foot in the information system display. Presser Foot up Safety Your machine beeps and won’t let you sew when the presser foot is up. More Features Features & Benefits smarter by pfaff® 260c © 2014 KSIN Luxembourg II S.ar.l. All rights reserved. PFAFF and SMARTER BY PFAFF are trademarks of KSIN Luxembourg II S.ar.l. Tie-off function Press the tie-off button and your smarter by pfaff™ 260c will tie-off and stop automatically for a quick and easy finish. Variety of Stitches smarter by pfaff™ 260c has 27 stitches including utility stitches, decorative stitches, stretch stitches and a buttonhole. 6mm Adjustable Stitch Width Convenient for all types of sewing, such as appliqué, mending and decorative techniques. Easy to achieve your desired result. Automatic Stitch Width and Stitch Length When a stitch is selected, the best stitch length and width are set automatically. Hard Cover Protects your sewing machine when transporting it and keeps it dust free. PFAFF® Original Presser Foot System Five different presser feet are included for all your basic needs. smarter by pfaff™ 260c has a large assortment of optional presser feet. The PFAFF® Original Presser Foot System makes sure you can use the same presser feet on any PFAFF® machine. Integrated Needle Threader The integrated needle threader makes threading fast and easy. One-step buttonhole Snap on the buttonhole foot and sew repeatable buttonholes smoothly. 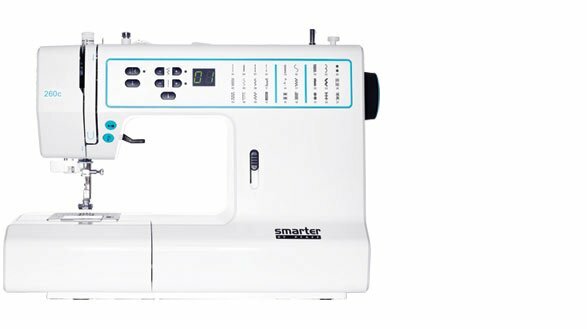 Your smarter by pfaff™ 260c automatically sews one-step buttonholes. Adjustable Needle Positions For exact placement of your straight stitch while topstitching, sewing zippers or special techniques such as piping. LED Light Long lasting light source that illuminates your sewing projects with a crisp light. External Feed Dog Drop Easily accessible on the back of the free-arm. Lower feed dogs for special techniques like free-motion quilting, thread painting and button sewing. Snap-on/Snap-off Presser Feet To change the presser foot, just snap it off and snap the new one on. No screw driver or other tools are needed. Thread Cutter A thread cutter is conveniently located on the side of the machine. It is easy to use and you’ll never have to worry about finding your scissors. Accessory Tray Removable accessory tray makes your sewing surface bigger and keeps all your accessories in order. Adjustable Presser Foot Pressure Presser foot pressure can be adjusted for specialty techniques such as quilting and sewing stretch seams. Always achieve a perfect result whether sewing light or heavy fabrics. Optimal Feeding The Seven Point Feed Dogs support the fabric on all sides of the needle while feeding your fabric perfectly. Makes your sewing smooth and pucker free. High Presser Foot Clearance High Presser foot clearance makes room for bulky projects or several layers of fabric. Accommodates even the thickest quilt when you’re quilting. Top Loaded Bobbin Easy access and good visibility makes it faster and easier to check and/or change bobbin thread. Free-arm Free-arm is perfect for sewing cuffs, necklines, hemming pants and more. 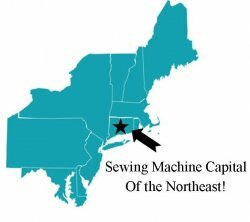 The needle is close to the edge of the free-arm for greater control and easier access when sewing.